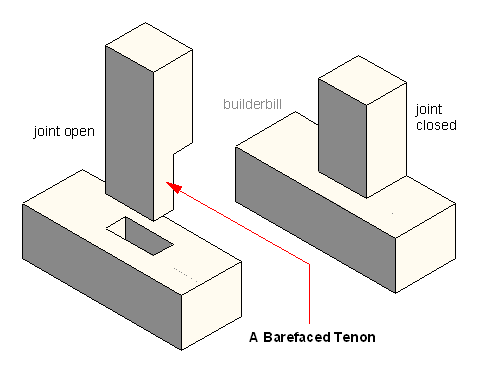 A tenon having only one shoulder. Typically where members with two different thicknesses meet. Above is a simple joint that shows the fact that both members are different thicknesses, while at the same time because of the bareface joint the thickness of the tenon is not reduced. Below is a typically application of the joint. A frame and filled door that has normal thickness styles and top rail, while the mid and bottom rails have been made thinner by the thickness of the infill boards.